Jenna Krantz doesn’t mind a challenge, or even juggling a few of them at the same time. The Grand Canyon University sophomore, a nursing major, says her anatomy and physiology courses were tough (she’s making straight A’s), the first job of her career needs to stretch her (she can’t wait to work in an emergency room) and her part-time gig on campus can’t be a snore (she’s a trusted special assistant to Assistant Dean Sherman Elliott in the College of Arts and Sciences). Jenna Krantz has become a go-to assistant for Assistant Dean Sherman Elliott of the College of Arts and Sciences. “I’m willing to put in the effort if it’s interesting to me,” says Krantz, 19, and apparently a number of things fit that description for her. 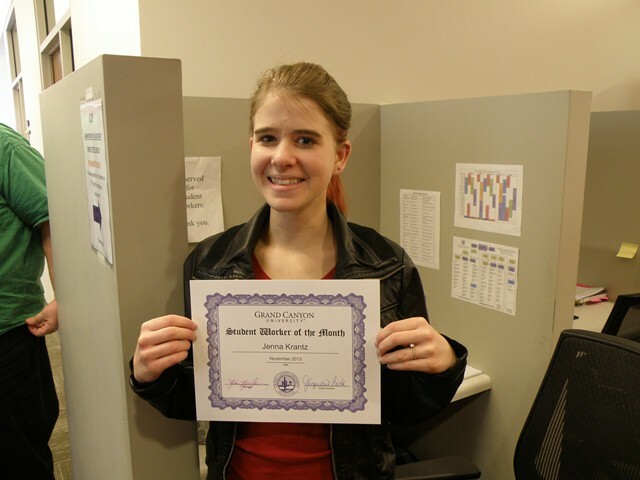 For her effort in CAS, she is the Student Worker of the Month for December, recognized as such by GCU’s Office of Career Services. In her third semester on the job, Krantz has become Elliott’s point person for special projects, helping with presentations and research. She has taken late shifts to accommodate the needs of the office. Krantz, of Tucson, says she enjoyed anatomy and science classes at Santa Rita High School and “decided I wanted to help people.” That added up to nursing for her, and she quickly zeroed in on the adrenalized action found in most ERs. She says she enjoys dorm life at GCU as a resident of Prescott Hall, and she appreciates the worship opportunities available on campus with Chapel and theGathering. “That’s not like a state school,” Krantz says, adding that she chose GCU over the University of Arizona and Northern Arizona University for reasons that included smaller class sizes and greater spiritual orientation. Next fall, she’ll dive headlong into the specialized coursework of the College of Nursing and Health Care Professions. “I’ve been told that I’ll have no social life and no sleep,” she says with a bring-it-on look in her eyes. In other words, no problem at all for Jenna Krantz.